First Class Free - Come in and pick up a voucher to enable you to try one of our classes for free! Class Timetable - Check out our Aqua and Aerobic Timetable - click on the Facebook link at right on the Home Page. Learn-to-Swim - Register now for our new term of Infant Aquatics Learn-to-Swim for bubs and pre-schooler from 6 months up to 5yrs. Classes commence May. Swim amd Survive Classes for children 5-14yrs get underway in early July - bookings open now! Shotz Nutrition - Purchase Shotz Nutritional products on site including energy bars, gels and electrolytes. Wynyard Fitness is a private boutique gym offering an intimate environment and a complete well being experience. The Centre comprises a 15m, 34 degrees pool, infra red sauna, fully equipped air-conditioned state of the art gym-cardio suite, aerobic studio and massage facilities. 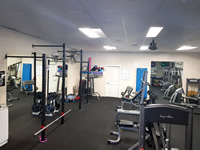 Whether you are interested in taking a studio or water class, working independently or wish to use the services of a personal trainer or follow a individually assessed fitness program, our motivated and friendly staff are here to assist and support you in achieving your fitness goals. We offer a range of membership packages, flexible multi10 passes and casual rates that will suit all budgets and individual needs as well as massage therapy. Call in and explore the possibilities! 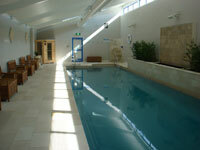 For all pool and leisure swims, call us to make a booking. For Aerobic and Aquacise timetable LIKE US on Facebook. * To find out more follow the blue links on the menu left.